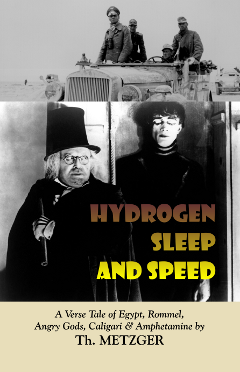 HYDROGEN SLEEP AND SPEED. A Verse Tale of Rommel, Egypt, Angry Gods, Dr. Caligari and Amphetamines by Th. METZGER. From the author of the startling novel Shock Totem, and underground classic poems like "Devil in a Dead Man's Underwear" comes what promises to be the weirdest book ever published by The Poet's Press (excepting perhaps Hakim Bey's landmark chapbook Chaos). This riveting poem cycle mines little-known aspects of World War II history into a melange of African invasions, angry Egyptian gods, rampant Mormon warriors, and the lord of sleepwalkers, Dr. Caligari, presiding over the Nazi obsession with not sleeping, ever, until the ultimate triumph (hence, the advent of mass-produced amphetamines). Brett Rutherford has illustrated this book with digital-art montages from The Egyptian Book of the Dead, Mormon histories, silent film stills and other historical sources (even Zeppelins bombing American truck stops). Published April 2011. ISBN 0-922558-57-4. 6 x 9, paperback, $16.95. Or download the PDF ebook for $4.99. CLICK HERE TO ORDER THE PRINT EDITION FROM AMAZON. CLICK HERE TO ORDER THE EBOOK EDITION FROM OUR ONLINE BOOKSTORE (LULU). ripening in her inner darkness. be released to the world. inky deep, shining with lower light. painted with the light of a nameless star. The trace of the beast and showgirl glitz. The old hint of primitive. high heels, the ghost of a goat foot. swollen up like an artery. yes! — Miss Turgid Jugular. Tight wire spangles catch the spotlights. lurid as a Florida orange. from the core of the soft solder coil. Flux to promote metallic fusion. There is something old in her face. Not old like a housewife who’s had too many kids too fast. and downs, courtesy of her brother, the drug company rep.
with a Thompson submachine gun. She is old like Emily Dickinson, self-imprisoned in her cobweb tower. forever denied the vote and the bride-bed. Or Edgar Allan Poe’s childwife, dying of consumption. And found them rightly understood, all messengers of love. revered the terrors of his law and humbly kissed the rod. 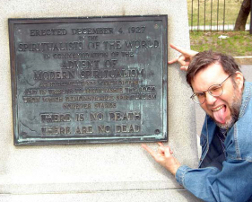 outside of Seven Stars, PA.
swearing they’d be back with dogs. Or the full moon ringed with all the colors of a week-old bruise. to expunge the figments of blood. “Yeah, sure, I killt him,” she said. though later on her English is pretty close to perfect. “What kind of candy is this? When it’s over, what does he find? sea journey through the X-ray channel. bring the image closer, clearer. Yes, there it is: Say ahh, please, and open wide. Behold: the hole in her heart. ringing her bell with his sledge-blow. O yes, this is her body.